What Is The Alameda County 4-H Film Fest? This as an opportunity for 4-H members to practice and celebrate their skills in film-making, while also honoring their work in the essence and style of the real Academy Awards! Filmmakers will be given a period between October thru April to complete a 3-10 minute film feature films or a 30-90 second PSA. All work will be submitted to a judging panel to be evaluated and winners will be determined by the evaluation teams. Then on with the show! All submitted films will be screened at the ACFF, and our 4-H filmmakers and actors will receive their awards and honors in the unique glamour of Hollywood. 4-Hers! Don't miss out on this grand event to see yourself on the silver screen! See you at the movies! New this year is a Photography Fest as well. See Photography Fest box for additional information. This VIP role will give you full access to the Film Fest event to interview and photograph the stars and capture the festival highlights! Don't miss out on this grand event! New addition this year: Photography Fest Competition! Alameda County 4-H Members may submit up to 2 8X10 photographs, either Color or Black & White. The photos must be mounted in matte frames (no wood/metal,glass framing allowed) and can be of any subject that fits with 4-H guidelines. Photographs MUST be pre-registered by 4/29/19. NO walk-ins allowed. Photographs are to be delivered to the event venue site by 12:00 pm on May 4, 2019. Alternately, they can be hand-delivered to Leaders' Council meeting on April 30th. Photographs will be scored against a rubrics and will receive certificates based on their award level. Additionally, Best of Class ribbons will be awarded in each age group (Junior, Intermediate, Senior). Any primary entries will receive comment sheets and participation certificates. Additional Judges Favorite ribbons will be awarded. 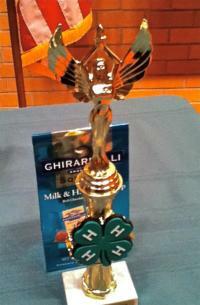 Award ribbons will be announced at the Awards Ceremony at Alameda County 4-H Film Fest. Have FUN making your film or taking photos for the Alameda County 4-H Film/Photo Fest? Want more opportunities to show your work? Additional competition venues are available. *Please note: some film competitions require that competitors abide by copyright infringement rules. Pay special attention to rules regarding use of music and images in your films for specific competitions. 1. All films must be produced by the 4-H members. All work, including script, directing, costumes, etc, is to be original work of 4-H members. Adult supervision and consultation is allowed, but immediate and/or direct adult work on the film is not permitted. 2. Each film crew may have ONE official adult supervisor that can only be consulted for advice, assistance, safety supervision, etc. The designated adult must not have direct involvement in creating the film. 1. All feature film entries must be between 3-10 minutes, including beginning and ending titles and credits. 4-H Promos and Other PSAs must be between 30-90 seconds each. They do not have to be related to 4-H themes. An overall "theme" has been removed to allow for more creativity and to better allow films to go on to further competitions. 3. Registration: Online registration through the link on this site is required. The films are to be posted in U-Tube format. and the link included in the online registration form. Online registration with the film link included must be submitted by Saturday, April 15th, 2019 a 8pm. After this date add-ons are not allowed. Please check that all films are downloaded in the highest quality formats as possible. Please do not film in 3-D.
4. All films will be eligible for the following awards, as appropriate for their category. The Alameda County 4-H Film Fest Evaluation Team will choose the winners of the first seven awards. The audience at the event will vote for the "People's Choice" award. Best Director - The director chosen by the cast and crew to lead the group (like a Junior/Teen Leader) that directs, and supports the cast. Best Special Effects - Film that presents illustrious use of special effects. Best Editing - The films will be evaluated on how smoothly they run and how seamlessly the various scenes come together. People's Choice: Voted on at the event by the audience viewing the films. 5. All films must have a title. 6. The cast/crew of the film do not have to originate from the same 4-H club. Non-4-H participants are allowed to act in the film, but the director and editor must be 4-H members. 7. Film teams are encouraged to create a poster for their film as an additional contest entry, but are not required to do so. 9. Any films using profanity and/or inappropriate material will be disqualified immediately. 1. Judging is to be completed by evaluators that have had film/acting/leadership/theatrical experience, optimally being a mixture of film industry professionals and adult 4-H volunteers. 2. Judging rubrics are to be used by the evaluation team to determine all award winners except the People's Choice Award. 1. The location of the event will be at the UCCE Alameda, Room 160. The date of the 4-H Film Fest will be May 4, 2019. 2. The dress code for the Fest Night is formal; ladies are encouraged to wear dresses (e.g. prom, wedding attire), gentlemen are encouraged to wear dress shirts, slacks, etc (tuxedos are not required). Jeans or t-shirts NT preferred.